- EUR slips -0.5% against USD, as others score gains. - As economic headwinds mount and ECB doubts proliferate. - Path higher for 2019 seen shallower and longer than before. The Euro has failed to capitalise on a more docile U.S. Dollar thus far in 2019, prompting bouts of consternation among some analysts who'd predicted a good start to the year and leaving the road ahead shrouded with uncertainty. Europe's single currency was down -0.56% against the greenback for the 2019 year-to-date on Wednesday, despite a 0% change for the Dollar index, which is a dire performance when compared with the 2% gains made by riskier currencies like the Australian and Canadian Dollars. This comes after Federal Reserve (Fed) chairman Jerome Powell told markets the central bank will be "patient" before raising its interest rate this year, in order for policymakers to assess whether a slowdown in the global economy will swing back to temper U.S. growth. That was effectively an open door invitation for the Euro and other currencies clobbered by the greenback last year to recover their poise. And many have, but Europe's single currency has not. Poor economic data emerging from the continent has played a key role in souring the market's mood toward the Euro this January, with a broad-based downturn in European industrial production during the final quarter having become more apparent this month. However, weakness in factory output is not the Euro's only economic ailment because surveys of purchasing managers in some of Europe's largest companies have also shown activity in the services sector too. Now, economists are convinced that Italy entered recession in the final quarter and many had also said Germany likely saw a recession at the end of 2018, until figures published by Destatis Tuesday suggested the bloc's largest economy narrowly avoided one. This faltering backdrop comes at a time when core inflation, which ignores movements in energy prices, is already low. If economic growth continues to fall then the European Central Bank (ECB) may not be able to go much further with its policy normlisation. Given the Euro's appeal to investors is hinged on the idea the ECB will begin lifting its interest rates from record low and negative levels this year or next, a persistent economic slowdown that throws the bank off course could be dangerous for the currency. 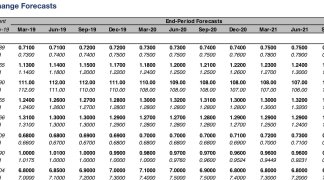 Below is a compilation of analyst views on the European economic outlook, as well as forecasts of how the Euro-to-Dollar rate could trade in the short term. The exchange rate was down -0.1% at 1.1403 Wednesday. "10year Bund yields are back at 21bp. That's nowhere near high enough to propel the euro upwards, pout of its current range let alone to the sunlit uplands above EUR/USD 1.20. If the US economy wasn't slowing, EUR/USD would already be the other side of 1.10." 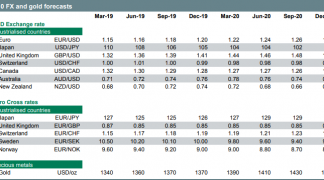 "We have a bias to be short euros against a trio of other currencies - EUR/JPY as the yen finds its feet and markets remain uncertain, EUR/AUD as lower US yields put some support under AUD/USD, and for now, EUR/GBP as hope of a softer Brexit scares GBP shorts." "The euro-zone has shifted down a gear but has not (yet) gone into reverse. Italy probably experienced a technical recession last year and Germany only narrowly avoided one. More importantly, the breadth of the downturn, which affected all major countries and most industries, means it cannot be dismissed as a minor local or sectoral difficulty. Instead, it seems to result from fading household consumption growth and, to a less extent, slower demand in China and the UK." Declining business confidence, partly due to the US-China trade war and the risk of a disorderly Brexit, is an additional headwind. With no convincing evidence that core inflation is set to rise, the ECB will have to acknowledge that economic risks have increased sharply when it meets again next week." "Euro area growth has slowed materially due to a broad-based contraction in industrial output. We attribute the downturn to several one-offs as well as uncertainty over trade and Brexit. The most notable drivers are a slower transition from EU emissions tests, transportation bottlenecks and a trade shock. We see scope for a recovery in Q1, despite some alarming developments in industrial activity." "We maintain a bullish strategic outlook on EURUSD for now, but recent developments have seen our level of conviction moderate. We expect the USD to trade on a softer footing overall. In the Euro area however, sluggish growth, ongoing political tensions, and lackluster core inflation pressures mean it may be some time before a strong EUR comes to the fore." "Stale USD longs in the face of deteriorating dollar fundamentals argue for a grind higher in spot, but we are patient as investors may take near-term cues more from technical factors than macro drivers until more clarity emerges." "EUR/USD has eased back to its 55 day moving average (MA) at 1.1385 and will ideally start to stabilise. The market last week broke above the 1.1500 resistance but has not sustained the break." "Dips lower are expected to remain well supported by the 55 day moving average at 1.1385 and should be contained by the near term uptrend at 1.1323. We favour a recovery to the 1.1611/23 200 day ma and mid October high and slightly longer term we target 1.1786, the 55 week ma." "2019 was supposed to be the year in which the ECB finally would decide to start raising its deposit rate. Even if the ECB's interest rate steps had been homeopathic, this would have been a significant signal for the euro: at least apparently the beginning of the end of unconventional monetary policy. However, we had to revise our view of the ECB." "According to our ECB observers, the current economic slowdown in the euro zone should prevent the ECB from taking this first step in 2019. We do not expect the first ECB interest rate hike until 2020. This year is likely to be dominated by uncertainty as to whether Europe's monetary policy makers will even initiate a normalization of interest rate policy in the foreseeable future." "The erosion of this outlook should weigh on the euro in the coming quarters, with the result that it should only gain moderately against a weakening dollar (see below). We therefore expect only little upward potential for the EUR-USD exchange rate. 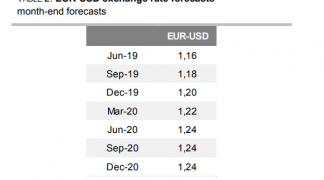 For the end of 2019 we expect EUR-USD exchange rates of 1.22." "Price action yesterday was revealing: by bolstering justification for the Fed’s more cautious stance on rates, more weak US data – the January Empire State survey and December PPI – were a red rag to would-be EUR bulls; but the currency took only limited and fleeting advantage of the USD before descending to the day’s lows." "Indeed, the market appeared rather pre-occupied with events elsewhere – events in the UK, judging by the way EUR/USD closely tracked cable (lower) through the afternoon; and clearly, the primary means by which Brexit-uncertainty manifests itself in the euro-zone is via weaker growth." "If investors are worrying about the growth implications of Brexit uncertainty, it is for good reason because even without it, investors would be forgiven for wondering if this is as good as it gets for euro-zone fundamentals in the current, aging cycle." "This is also to say that for a year in which the ECB plans to take its first tentative steps on route to policy normalisation, the omens are not encouraging." "Yesterday’s price action certainly serves as a reminder that a slowing of the US economy and a decline of US rates can only translate into US dollar weakness when we at least have some evidence of growth stabilising abroad. Our view of the EUR managing to drift higher this year is based on that evidence emerging and we continue to view some of the current scale of downturn reflective of temporary factors that should subside." 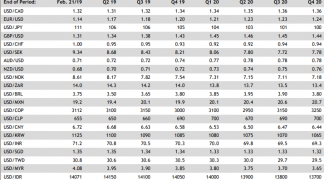 "Partial German GDP data released yesterday suggests some modest rebound took place in Q4. While GDP growth of just 0.1% Q/Q is hardly cause for celebration it’s in the right direction and should be reinforced by better domestic demand conditions given consumer spending support from strong nominal wage growth and falling energy prices."